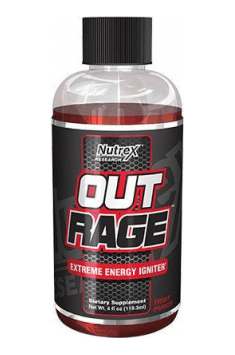 Nutrex Outrage Shot is an incredibly effective pre-workout supplement closed in the form of a comfortable shot. In the composition of the formula designed by the producer under the name Extreme Energy Igniter there are the most effective substances in optimally selected proportions and sufficiently high doses in order to work even for the most experienced sportsmen. Beta-alanine – is contained in the supplement in the form of Carnosyn, the purest raw material in the World. Its activity is based on the stimulation of carnosine synthesis, a protein exhibiting a great influence on the human organism. In the context of effort abilities, it buffers the activity of lactic acid, delaying fatigue and increasing regeneration possibilities of muscle tissue. It also increases contractibility of myocytes, influencing the improvement of strength results. When it comes to health, increased production of carnosine has protective effect towards the health of the cardiovascular system and reduces oxidative stress. Taurine – is a natural creatine transporter, increasing its bioavailability. In this way, it stimulates oxygen energy processes on the cellular level, positively influencing effort abilities. It also takes part in the transport of nitrogen, intensifying regeneration processes and muscle tissue anabolism. When it comes to the functioning of the brain, taurine increases cognitive abilities, shortens reaction time and facilitates concentration and memorization. Tyrosine – is a precursor of many hormones with stimulating effect. By constituting a substrate in the synthesis of thyroxine and triiodothyronine, it stimulates metabolism, while being on the pathway of the production of dopamine, noradrenaline and adrenaline, it increases their secretion, modulating the functioning of almost all the systems in the organism. Tyrosine increases effort abilities, delays fatigue and also positively influences motor coordination, association abilities and memorization. It also works like an intracellular transmitter, regulating the functions of cells and increasing its work efficiency. Caffeine – the most common stimulating supplement, appreciated both by people working behind a desk and world-class sportsmen. Thanks to the two independent mechanisms of activity (competitive inhibition of adenosine receptors and cAMP phosphodiesterase) it is an incredibly effective stimulant. It holistically supports the abilities of the organism by stimulating all the systems in the organism. It strongly stimulates, increases physical ability and decreases the feeling of fatigue. It works synergistically with stimulating hormones, increasing their effect. In Nutrex Outrage Shot there are no innovative ingredients with unproven effect. This supplement is based on the best-known, effective ingredients, which when used in appropriately high doses, maximally increase effort abilities and positively influence regeneration. Comfortable form of the supplement in the form of small bottle allows to always have a huge energy boost at hand. Dissolve one portion (1 portion = 1 scoop) in 200-300 ml of water. Drink around half an hour before training. Shake well before drinking. This supplement will work great also as support in the periods of increase mental burden. Almost all the active substances demonstrate positive influence on cognitive functions, facilitating concentration and memorization. Additional stimulation prevents weariness during mental effort. For this effect, it is suggested to drink the preparation in a few small portions. Blue Raspberry: Water, Phosphoric Acid, Natural Flavors, Sucralose, Citric Acid, Sodium Citrate, Potassium Sorbate, Sodium Benzoate (preservatives), Acesulfame Potassium, FD&C Blue 1. / Fruit Punch: Water, Phosphoric Acid, Citric Acid, Natural Flavors, Sucralose, Sodium Citrate, Sodium Benzoate and Potassium Sorbate (preservatives), Acesulfame Potassium, FD&C Red 40.